Who are this year's "Resource Innovators" in the chemical industry? 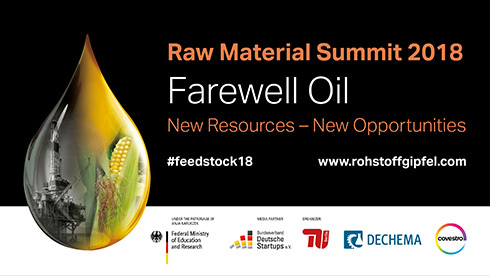 The second Berlin Raw Material Summit on June 25th honors the best business ideas that use sustainable resources such as plants and CO2 instead of fossil resources such as oil. The event at the Technische Universität (TU) Berlin sends out a signal for more entrepreneurial spirit in chemistry and calls for increased action to promote the use of non-fossil raw materials. The Raw Material summit will be organized by TU Berlin, the DECHEMA Society for Chemical Engineering and Biotechnology and the global materials manufacturer Covestro. There are already many promising approaches in the industry for the production of economically viable chemical products with less or no crude oil and for their economic use. Germany can play a pioneering role here. The Raw Material summit helps to quickly implement the interaction of many players in corresponding business ideas and projects. Do you work in the field of sustainable chemistry, sustainable use of resources or raw material innovations? As you develop new products, services, and business models, apply and take advantage of the Raw Material Summit to pitch the idea of your startup! The winners of the ideas competition will receive prize money, attention from the right audience and useful contacts in the industry. An expert jury headed by DECHEMA Director Prof. Kurt Wagemann and Prof. Reinhard Schomäcker from the Institute of Chemistry at the TU Berlin will select the most promising business ideas. If you are interested, please apply for our startup contest! is Policy Advisor for Climate Protection and Energy Policy at WWF Germany. The WWF (World Wide Fund for Nature) is one of the largest and most influential environmental organisations with offices in 80 countries. The aim of the WWF is to stop the worldwide destruction of nature and the environment and to shape a future in which man and nature live in harmony. is Product Director at PatSnap in London, where he founded the platforms for chemical innovations and sequence innovations. Dr. Hussein is also a member of the advisory board of the Berlin start-up centre "Chemical Innovation Factory". is a member of the advisory board of High-Tech Gründerfonds, Germany's largest seed investor for tech start-ups. The company invests venture capital in tech companies that want to bring promising research results to market maturity. Prof. Dr. Jahn headed BASF Group's Global Competence Center Science Relations and Innovation Management from 2000 to 2012.
has been State Secretary in Berlin since 2014. Until 2016 he was State Secretary for Science in the Senate Department for Education, Youth and Science. Since December 8, 2016, Krach has been State Secretary for Science and Research in the Senate Chancellery of the Governing Mayor of Berlin. is CEO of Covestro AG since June 2018. Previously, as Chief Commercial Officer of Covestro AG, he was responsible for innovation, marketing and sales. The company develops and produces chemical-based materials for many key industries and areas of daily life around the globe. is President of the Technical University of Berlin. He has been a professor of experimental solid-state physics at the TU Berlin since 1994 and the author of over 500 publications. Since 2016 he has also been a member of the German Academy of Technical Sciences (acatech). is Managing Director of DECHEMA Gesellschaft für Chemische Technik und Biotechnologie e.V. DECHEMA is a non-profit association representing more than 5,800 members from industry, universities and research institutions and bundling their expertise in an interdisciplinary network.